Smith, Digby. 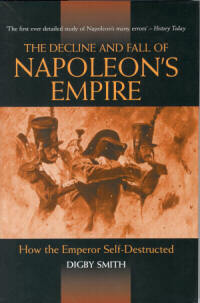 The Decline and Fall of Napoleon's Empire: How the Emperor Self-Destructed. Greenhill Books, 2005. 239 pages. ISBN# 1853676098. Hardcover. It's already been several years now that Mr. Digby Smith's prolific work hasforced me to set a separate bookshelf for his books. This time my latest addition to this shelf is his new book, The Decline and Fall of Napoleon's Empire: How the Emperor Self-Destructed. I was intrigued by its title, which reminded me, and certainly many others, that magna opus work by Edward Gibbon on the rise and fall of the Roman Empire. Certainly, Mr. Smith faced a much more difficult task of explaining the fall of Napoleon's empire in only 239 pages. Regrettably, I cannot say he was successful at this. The book is divided into eleven chapters, each dealing with certain aspect of Napoleon's fall. Chapter one, entitled, "The Steps to the Throne", traces Napoleon's political life starting with his election as Consul for Life in 1802. Mr. Smith argues that "perhaps Napoleon's first major error was committed on 2 December 1804, when he crowned himself Emperor of the French Republic" and proceeds to describe Napoleon's attempts to reform the French society and creation of a "sort of crowned cosa nostra" of members of his family and his followers. Mr. Smith is certainly right in criticizing Napoleon for elevating his inept family members and stressing that this nepotism "was to be a major factor in his downfall." While this reviewer agrees with author's general assessment of Napoleon's siblings, his opinion of Lucien Bonaparte seems unfair since, according to Mr. Smith, Lucien became "so rich that he had no need of help from Napoleon; his greed was satisfied." In fact, Lucien's political ambition was far from being satisfied and his disagreement with his brother certainly stemmed from other factors beside him becoming a filthy rich. Chapter II, entitled "Military Blunders", concentrates on two military affairs, Battle of Marengo (1800) and Napoleon's failure in naval affairs in 1805. Mr. Smith provides a brief account (four pages) of events preceding the battle, Napoleon's failure to properly evaluate his situation on the eve of 14 June and his narrow escape from defeat. The section on 1805 is longer (14 pages) and more detailed. Author sets the stage by describing the state of seamanship and naval affairs in general in 1805 and traces Napoleon's involvement in the navy since the 1798 expedition to Egypt. Using excerpts from Napoleon's letters and orders, he weaves together the Emperor's "grasp of the importance of economics" and his failed policies against Great Britain leading to that fateful encounter between the French and British forces at Trafalgar. Moving from mainland Europe, author then concentrates on the relations between France, Britain and the United States. He examines the British Orders in Council and Napoleon's decrees in light of their effect on the United States, which led to the war between the U.S. and Britain in 1812-1815. Mr. Smith is correct in stating the after Britain issues the Orders in Council, Napoleon understood well that "to have done nothing would have been utterly unacceptable as this would have laid bare his helplessness for all in France to see, resulting in irreparable damage to the reputation of his regime." (p. 70). Continental System was indeed one of the most, if not the most, important mistakes Napoleon committed. It led to embitterment of virtually entire continent and his eventual involvement in Portugal in 1807, Spain in 1808 and Russia in 1812. Quotes from the Correspondence seem to reveal that Napoleon often misrepresented the real condition in Europe and led himself astray of reality. A short Chapter 4 (9 pages) introduces reader to Napoleon's siblings - Jerome of Westphalia and Joseph of Spain - ruling various principalities of Europe and falling far shot of expectations. Chapter 5 – "Napoleon, Centre of the Universe" – turns to military affairs and opens with the discussion of Napoleon's headquarters. The detailed description mainly highlights Napoleon's rough handling of his subordinates, flaws of the headquarters operations and lack of an adequate training organization. However, author finds some words of praise and notes that the 1813 Campaign shows Napoleon's "absolute command of the subject matter, logical decisions and amazing powers of memory and decisiveness." (p. 106) He is overly critical of Marshal Berthier, who is effectively describes as a "mental midget" and disapproves of Napoleon's failure to find "his cerebral equals." The remaining sections of this chapter discuss Napoleon's personal accommodation on road, his aides-de-camp, orderly officers, intelligence gathering, and Marshal Berthier's and Count Daru's staff. These passages (about a page each) contain some analyses and highlight flaws within the system. Probably recalling a recent debate on comparison of Napoleon's staff to the NATO staff organization, Mr. Smith devotes several passages to disapproving any parallels. Chapter 7 is dedicated to Napoleon's "great blunder" of invading Russia in 1812. In some eighteen pages, he quickly outlines the causes of Franco-Russian conflict, Napoleon's preparations and events of the six-month invasion of Russia. The author repeats the well known arguments against Napoleon for mishandling logistics, appointing his brother Jerome to lead French corps against Prince Bagration's army, his failure to stop at Vitebsk and Smolensk, hesitation at Borodino and long stay in Moscow. The retreat is covered in less than a page and the chapter then follows Napoleon all across Europe to the Tuileries Palace, ending with the famous 29th Bulletin of the Great Army. Chapters 8 (10 pages) and 9 (nine pages) analyze Napoleon's 1813 Campaign with a detailed discussion of the Battle of Leipzig. Chapter 10 quickly moves through the events of the 1814 Campaign – an "amazing string of victories" as the author calls it - and his first abdication. The last chapter sums up Napoleon's return to power in 1815 and his historic campaign against Prusso-British army in Belgium in June 1815. A one-page epilogue shows Napoleon writing a letter to the British Prince Regent and lowers curtain over Napoleon in his lonesome exile on St. Helena. After completing this book, I felt both enlightened and disappointed. The author raises a few interesting questions and his arguments were, at times, refreshing. However, there are a few drawbacks, which to some degree are publisher's fault. Although the review in History Today claims this is "the first ever detailed study of Napoleon's many errors," it will be impossible to produce a detailed and well-balanced study of such a complex issue within 239 pages. Reader will be probably frustrated by lack of detail on domestic policies, diplomacy and economy; main emphasis is on the figure of Napoleon, who certainly was not solely responsible for his own demise; there is virtually no discussion of others political actors that contributed to the demise of Napoleon’s Empire. Mr. Smith should be certainly commended for his attempt to produce this book within the tight limitations set by the publisher. He states early in his book that "readers will learn something new about Napoleon" and novices to the subject will certainly do, though the complexity of the matter might leave them confused. More expert readers will be probably dissatisfied with general nature of its content. One of the strongest points of the book is the numerous quotes/transcriptions spread throughout the narrative. Most of them come from Napoleon's Correspondance and having English translations of so many passages is certainly a big plus. However, these quotes also have a drawback since, at times, this book turns into a series of quotes and transcriptions with limited or no analysis. Some sources are used more often than others, which tends to slant the narrative. Some quotes are excessively long— for instance, Chapter 3 (27 pages long) has eleven pages of citations, Chapter 4 (nine pages) had roughly six pages of long quotes and Chapter 9 (also nine pages long) contains two quotes that take up five pages; the account of Waterloo is virtually overshadowed by Antoine Fortune de Brack's memoirs that consume roughly five pages out of eleven. Another comment should be made on footnotes, which are used infrequently. Correspondance is usually, but not always, credited but even then it is given as "Correspondance CLXII" in the opening chapters and as "Correspondance 20190" in the subsequent chapters. Citations from primary sources are not referenced but list of books at the end of the book contains bibliographic information on works quoted. Chronology is noteworthy for missing several important events, including Peace of Amiens (1801), battles of Pultusk (1806) and Eylau (1807); capitulation of Ulm is dated 15 October instead of 20th.